These dainty little salads are perfect for entertaining. They make a delicious starter, canapé or nibble with drinks. 1. Plunge the shredded kale leaves into a pan of boiling water, return to the boil and cook for 30 seconds. Drain and plunge into cold water, then drain and dry on kitchen paper. 2. Roughly break up the nuts in a pestle and mortar. Cut the grapefruit and avocado into small cubes and place in a bowl with the kale and nuts. 3. Place all the dressing ingredients into a bowl, season and whisk to combine. 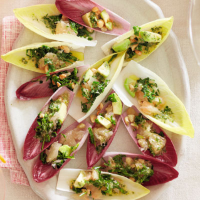 Spoon a little salad into each chicory leaf and arrange on a serving plate.